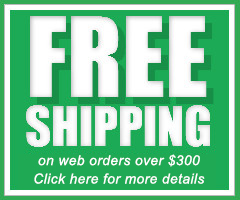 Diamond Design Stair Tread - Half diamond design, half smooth; a longer adjustable nose to fit pan filled steps, molded concrete or terrazzo steps. Use in commercial, industrial, office or institutional building. Diamond Design (6" deep) covers impact area of pedestrian traffic. Helps make steps safer. Meets Federal Specs. RR-T-650E and ZZ-T-001237 (GSA-FSS). Install with No. 400 Neoprene Contact Adhesive and #110 Epoxy Nose Caulk. 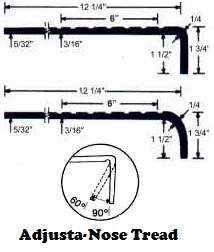 Square nose are available in Colors I, II, and III; Round nose are available only in Colors I. An abrasive mineral coated Grit-Strip is recessed the full length of the stair tread at impact area to help prevent slipping. This anti-slip strip meets specifications for the contrasting color to alert Visually Impaired people. 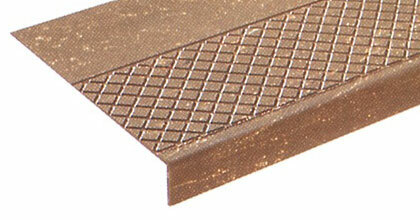 Design surface with Grit-Strips offers added safety and longer wear. All stair treads have color through entire thickness. The stair treads meet Flame Spread Rating of 75 or less using ASTM-E-84 Test.